A massive salmon “spill” at a fish farm in southern Chile last week is once again tainting an industry that earned the country more than $4 billion last year. About 900,000 salmon escaped from a Marine Harvest ASA farm during a storm on July 5, according to the Bergen, Norway-based company. The fish are not fit for consumption, Marine Harvest said in a press release. Chile’s salmon industry was already under attack for the use of hundreds of tons of antibiotics every year and allegations that the dumping of dead fish in the past have fueled algae blooms that damage the local fishing industry. The escaped salmon are a non-native species to southern Chile and could harm other fish stocks, while their decomposition adds to ammonia in the water, potentially fueling a fresh outbreak of algae bloom, Greenpeace Chile Oceans Coordinator Estefania Gonzalez said. Marine Harvest said it would minimize the possible environmental impact of the escape, and try to recapture as many of the fish as possible. It is investigating how the incident could occur and will be inspecting all sites to ensure they are in accordance with its engineering standards. Marine Harvest recorded 15 escape incidents worldwide in 2017 totaling 23,223 fish, according to its annual report. “Salmon escapes are not only a danger for human consumption, but if they are not recovered, they will act as predators, generating serious environmental consequences. It is clear that there are safety and environmental impact standards that the industry is not fulfilling. In fact, artisanal fishermen are the ones who have had to go to the rescue of the company. Much smaller escapes have determined the end of the salmon activity in other countries, “said Estefanía González, coordinator of oceans for Greenpeace of the massive salmon escapes this week from a Marine Harvest industrial salmon farm south of Puerto Montt, Chile. 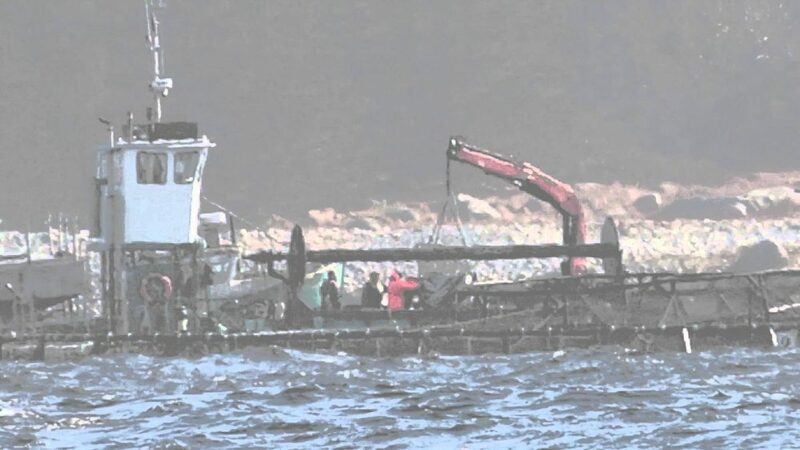 González is referring to the recent ban in Washington State as a result of a massive salmon escape from industrial salmon feed lots owned and operated by Canadian multi-national Cooke Aquaculture. Cooke has a large presence in Chile and has had several of its salmon feedlots quarantined due to infectious salmon anemia (ISA) outbreaks over the years. To graph the severity of the current emergency, it is necessary to consider that during the whole of 2017, the Chilean salmon industry recorded the flight of 212,000 fish. “We are facing a fact of the utmost gravity. It is a potential environmental disaster whose consequences for the area are to be seen, but which can be very serious. Not only is it one of the largest salmon escapes in Chile, but the fish that escaped have high doses of antibiotics, which is a danger and can not be consumed, “said Estefanía González, Greenpeace’s ocean coordinator. For the NGO, the massive escape leaves in question the real capacity to operate under safety standards. “It is necessary that the authorities investigate the causes of this flight and proceed with the corresponding sanctions. It can not be that a simple temporary, nothing out of the ordinary in the area, generates an emergency of this magnitude. The center was installed in 2017 and in less than a year presents this emergency. It is evident that there are safety and environmental impact standards that are not being met. In addition, at the center, there was no personnel available to activate contingency plans and they could not enter until two days after the emergency. This reflects the limited capacity of salmon farms to face this type of contingency. The most serious thing is that, instead of being the company itself that responds with a serious and own reaction plan. Greenpeace exposed the case of the leakage of less than 200,000 salmon from a Cooke Aquaculture farm in the United States, an escape that resulted in the recent decision by the State of Washington to end salmon activities from the year 2025 due to the serious environmental consequences that the activity has had in the extensive sea areas of the state. For its part, Chile’s aquaculture regulator Sernapesca made a call for consumers not to consume the escaped salmon.